From air motors to vacuum generators, Gast supplies the pneumatic products that leading OEMs rely upon to run their applications smoothly and efficiently. Built to withstand rugged operating conditions for high-pressure, oilless operation. Includes model numbers that start with 1-7L, 1-7H, 1-5V, PAB/PBB/PCA, and VAB/VBB/VCD. Our ROC-R rocking piston line combines piston pump durability with diaphragm pump efficiency, proven outstanding performance and flexibility. Model numbers usually start with LOA/LAA/ROA/RAA/SOA/SAA or XR, where X is a number. : Pulsation-free, minimal vibration with long service-free life for oilless or lubricated applications. Includes model numbers starting with a 4 digit numeric sequence (ie - 0323). : Compact, quiet source of vacuum or pressure. Miniature styles are ideally suited for a variety of light-duty applications. Model numbers usually start with DOA/DAA/MOA/MAA or XD, where X is a number. : Extremely quiet, highly efficient operation and simple maintenance due to principles of electromagnetic oscillation. Model numbers start with C/SPP/HP. For high-volume vacuum or compressed air applications. Several models are available with explosion proof motors for soil vapor extraction applications. Models numbers start with RX, where X is a number. : Rugged and reliable, a broad range of models are available in lubricated and oilless styles. Model numbers start with XAM, where X is a number. Low cost, compact alternative to traditional vacuum pumps in single and mutli-stage designs. Includes model numbers starting with VG. UL2125 Listed oilless piston air compressors for dry sprinkler systems. 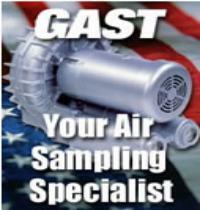 Please note - Gast's line of air motors, compressors, and vacuum pumps are designed to be used in the movement of air, and are not suited for use with liquids, combustible gases, or use in combustible environments unless otherwise indicated. The information presented within this website is based on technical data and test results from nominal units. It is believed to be accurate and is offered as an aid in the selection of Gast products. It is the user's responsibility to determine suitability for the intended use and the user assumes all risk and liability whatsoever in connection therewith.